LeSean McCoy hasn't been shy this offseason about calling himself the best running back in the NFL. On Wednesday, he accepted an award for being the best at something else. 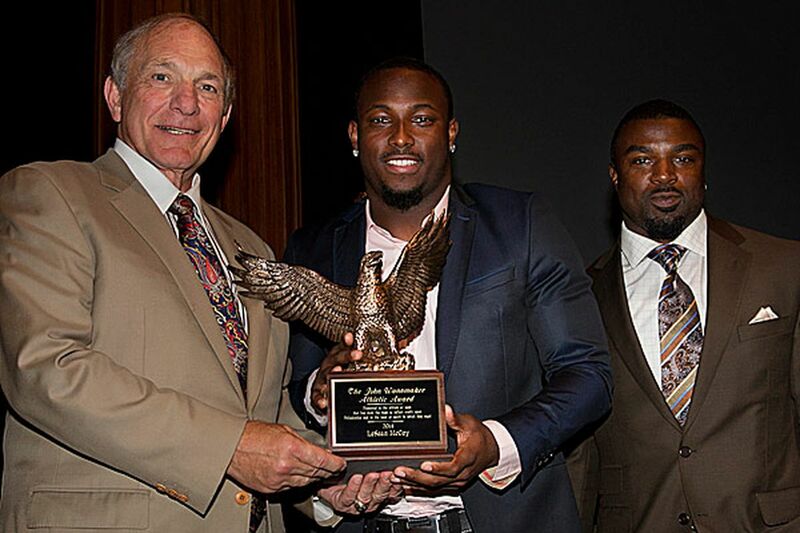 The Eagles running back received the John Wanamaker Athletic Award for being the athlete who "has done the most to reflect credit upon Philadelphia and the team or sport in which they excel." McCoy was honored by the Philadelphia Sports Congress in the Crystal Team Room at the Wanamaker Building. McCoy became the sixth Eagles player to win the award and the first since Donovan McNabb in 2007. He was lauded for his 2013 season, when he led the NFL in rushing with 1,607 yards, and for his work with local charities. "There's a lot of names I've seen on there, the winners in the past," McCoy said before the ceremony. "To see my name is pretty cool, too." Another great Eagles running back, Brian Westbrook, spoke about how McCoy has grown since the team drafted him in 2009. In a video, former NFL great LaDainian Tomlinson congratulated McCoy and proclaimed him the NFL's best running back. McCoy thanked his teammates, coaches, and family. He said his older brother LeRon was his role model. "The guy I really wanted to be like was my brother," McCoy said. The Philadelphia Sports Congress presented a lifetime achievement award to Tina Sloan Green, cofounder and president of the Black Women in Sports Foundation, which received the Robert P. Levy Community Service Award. The first African American head coach in the history of women's intercollegiate lacrosse, Sloan Green coached Temple from 1973 to 1992. The Parks and Recreation Department gave its Sports Volunteer of the Year Award to Ruth Bull, founder of the International Tuzos Philadelphia Soccer Academy. "That would [stink] to lose him for that many games," McCoy said. "The good thing is you have [tackle Allen] Barbre. Barbre is a sure veteran backup who we gave some money to because we know he can play. If he has to come in and step in and play, we're confident with him." With or without Johnson, McCoy hopes to be even better this season. "I'm wondering if I get 2,000 yards, can I win it next year?" McCoy said with a laugh.